Cyber Monday Deals Worth it? Yes. But it’s kinda like shopping CostCo or Sam’s Club. You haven’t really saved money if you bought something on impulse that you really didn’t need…even if it WAS at a great price. Cyber Monday started in 2005 with the support of shopping trade group (shop.org) that noticed a spike in online Monday sales following Black Friday. This year’s online sales will top last years, which topped the year before…and so it will continue until Congress decides to legislate sales tax on the whole process nationwide. Americans are expected to spend $1.5-billion today, up 20% from last year. Amazon.com is the poster child for Cyber Monday, and online sales in general. Zappos.com (a Las-Vegas-based company, I might add) is now owned by Amazon, because Amazon saw a winning customer-service culture they wanted to adopt. Checking what guarantees, return-policies, and shipping arrangements you get on your Cyber-Monday purchase could be the difference in whether you really get a “deal” or not. Your first tip for Cyber-Monday shopping: if you have ANY questions, call to talk to a live person. The response you get is one of your first indicators as to what kind of operation you’re dealing with. 1) Fraud and stolen ID issues are rampant. Use a credit card, not a debit card. A debit card is a passport to your bank account. Consumer protections are much greater when using a credit card. Also, use only ONE credit card for all the purchases…that way you better control any fraud damage that might occur. 2) Twitter issued a Cyber Monday guide, encouraging users to follow accounts such as @PriceGrabber, @RetailMeNot, @MoneySavinQueen and @CouponCabin. ‘Might be a good idea to check out those profiles today for announcements. Shop.org will have “Deals of the Hour,” with 24 retailers offering deals that include free shipping, free gift with purchase or dollars off already-reduced goods. Retailers including Kohl’s, Sony, Toys R Us and DSW will participate. 3) There’s no good or bad time today to buy. The deals started at Midnight (or before). Watch all day long online for announcements. 4) Many of the largest retailers are offering free shipping this season, so don’t pay a fortune to get your purchases. If you’re not having luck finding free shipping on Cyber Monday, Free Shipping Day is Dec. 17. More than 1,000 retailers are offering free shipping on products guaranteed to arrive before Christmas. To find out who is offering free shipping on Cyber Monday, go to CyberMonday.com. (tip from 7 Answers to Get the Most out of Cyber Monday). 5) An increasing number of apps can help you navigate the world of e-commerce with your smartphone or tablet. For example, the Find.com app helps you compare prices of items online and watches when they drop. The PriceBlink app self-activates every time you shop online and will alert you to coupons and special offers for the site you’re shopping on. It also lets you know if the same item is available for less anywhere else in cyberspace. 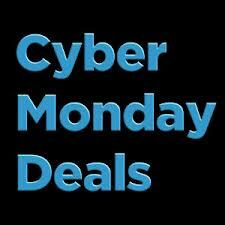 The TGICyberMonday app aggregates Cyber Monday deals from major retailers. (tip from 5 Tips for Online Shopping Success).